← Kentwell Kit – non clothes! 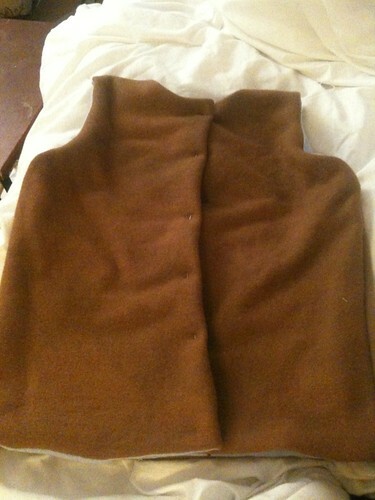 These were the last things that I made before Kentwell, and one is utterly shapeless for BB, and the other started off life as the waistcoat in tudor tailor, but I abandoned that as my wool was too thick for it to work – heavy linen or light wool is better for it! 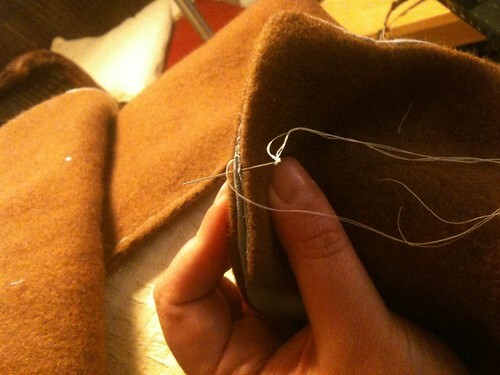 I will do the disclaimers still – I had made nothing before I started sewing for Kentwell, I was an utter untutored beginner, I still am not much more experienced! 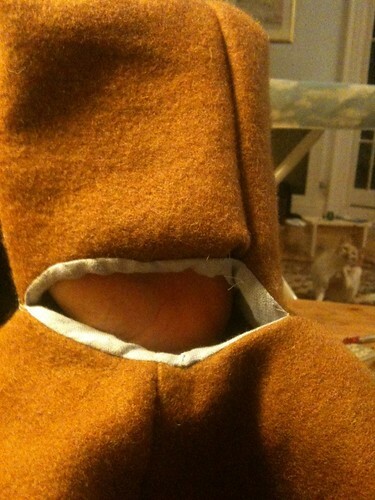 These posts show for me what I did because I am proud of it and they may give a novice some pics to help them with making, but they are not proper ‘costume notes’ from an expert! does that disclaim enough? I went for unfitted and slight wrap over the front so room to grow look . This is an excellent and period look for all coats/jackets for the poorer end of the spectrum. I had bought some dayglo orange pure wool from a friend and overdyed this with brown, and got a fab dark old gold/brown colour. 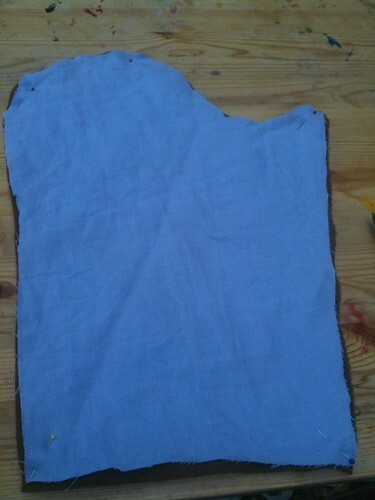 I lined with the blue linen that I have so much of. 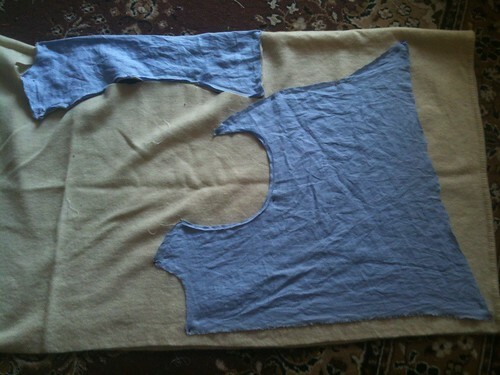 I then cut out the exact same in the wool. 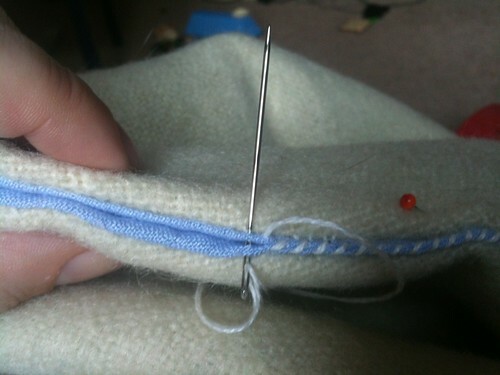 Hving done that, I sewed up the linen side seams with backstitch and the wool sideseams with backstitch, placed the 2 right sides together and then sewed up along the bottom and around armholes and across the neck. 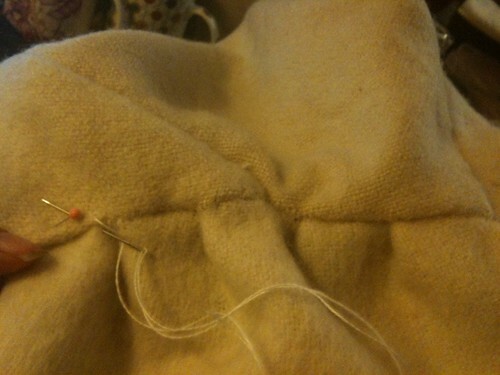 I then turned right side out, and pinned the turn of wool over the linen for the front edges before sewing when happy with position. 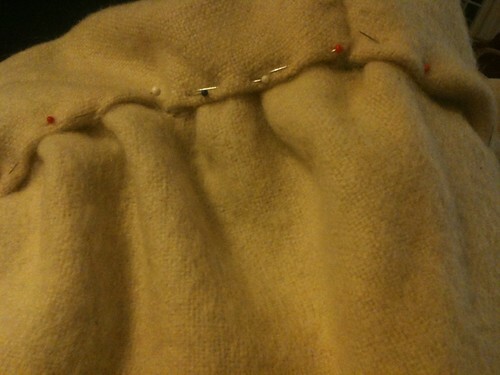 I sewed the shoulders together in 2 layers – whipstitch to linen and ladder to wool. I didn’t do this firmly enough to allow for the rough use BB gave it, so ended up resewing it whilst there in rough linen! 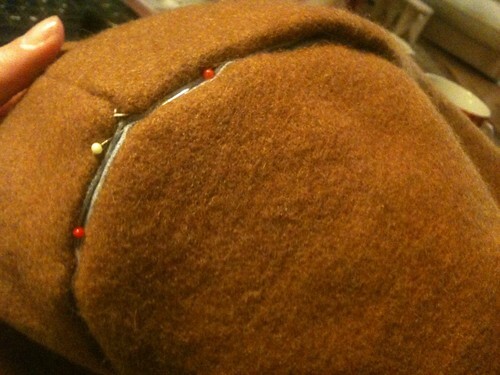 so i would suggest that for a kid, this is sewn v strongly!! 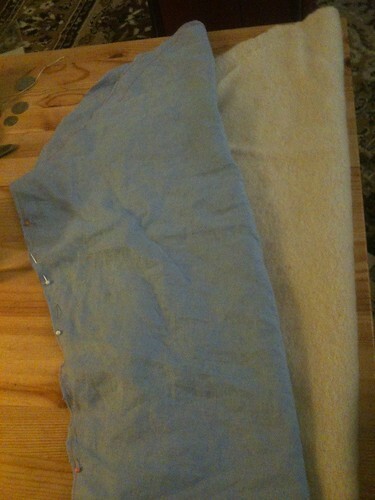 Finally, I did the sleeves – lining in blue linen, cut out 2 linen and 2 wool, sewed the linen long seam, sewed the wool long seam, placed right side to right side and sewed around the top, cut the triangles into the seam allowance that help it sit right, and turned the right way round. 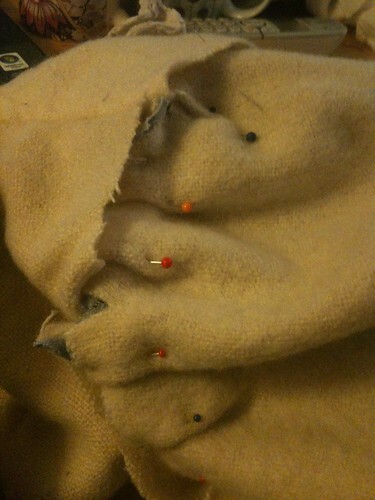 sewed the cuff end up. 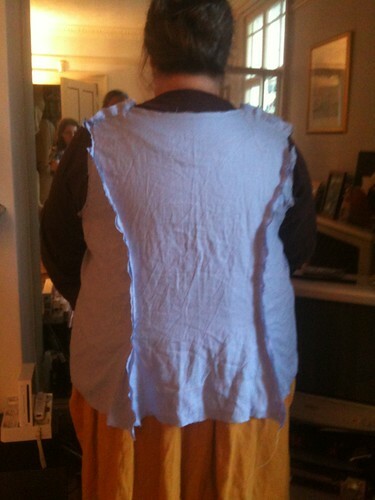 i used the sleeve toile for the kirtle, but made it wider so would go over kirtle sleeves. BB ensured the arm did move freely and we were done . there was no closure mechanism on this jacket, it is just wrapped around, but ties on top corner would work too. 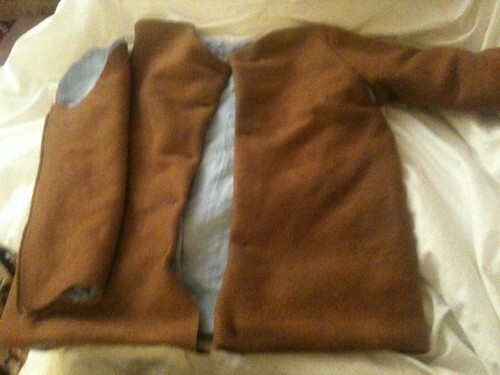 Now initially I tried to be clever – a mistake, and a friendly kentwell elf shew me the error of my ways, and promised to help in the winter should i still want to make the gored jacket in the tudor tailor book. It does look excellent, but there were 2 main problems – 1, I was using blanket, which was too thick [the main problem] and 2, i was struggling to get the tailoring right at the front. 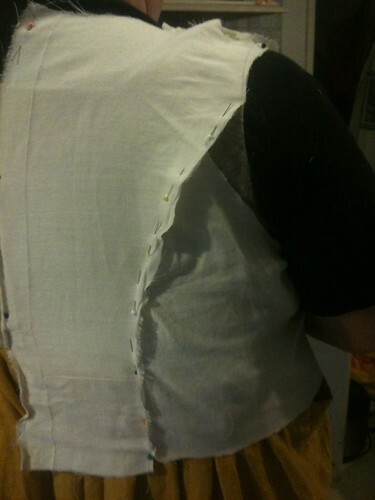 so what i made in the end was something with a more fitted back, and a boxy front! 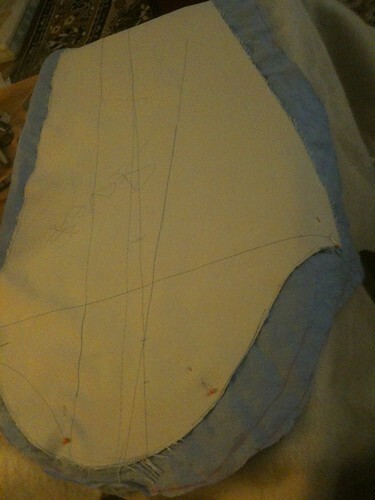 First tho I made a toile, got my dh to help pinning the back so it would have a nice line to it. I remain happy with this at the back , but i didn’t pay enough attention to getting it ‘sharp’ for the front. 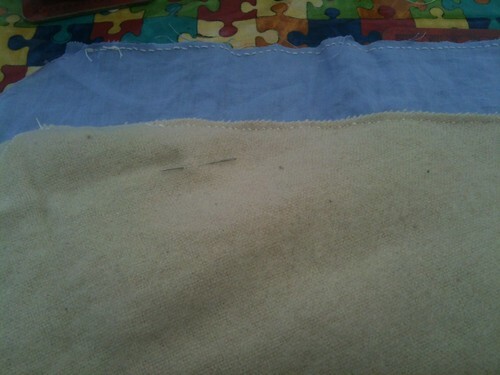 However, I went ahead and made it up in the blue linen [I had lots and lots of this as found a bargain ] as a toile mark 2 .
i cut out of blanket – ‘loomstate wool’ which was a lovely blanket, in the family for a long while unused but cared for – so prob the most expensive wool of all! 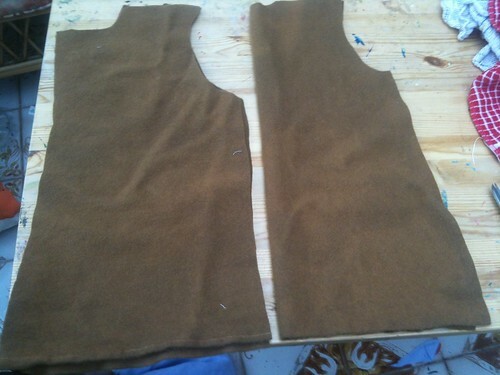 this time, instead of sewing linen together and then wool, I sewed the pieces together in panels – like the partlet – so rightside innermost linen to wool, leaving armholes unsewn and the bottom. 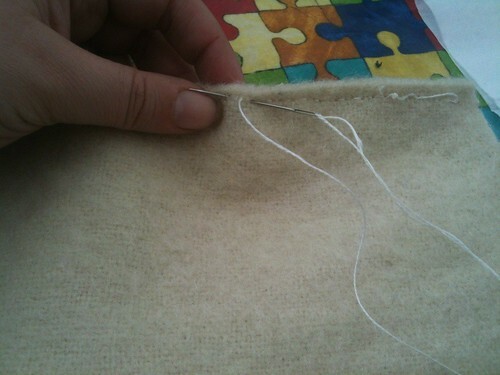 then i turned back to the right way out, whipstitched the linen of the panels together and then ladderstitched the wool. 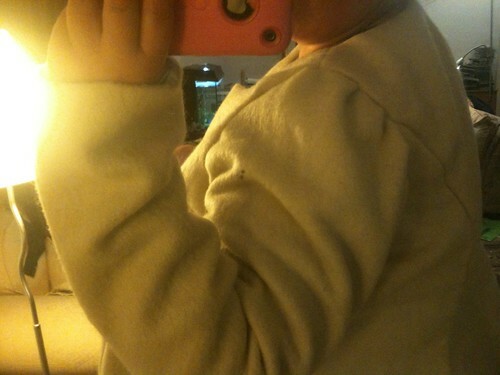 i also hemmed along the bottom and sewed the shoulders together. it does have sleeves and these were made next. 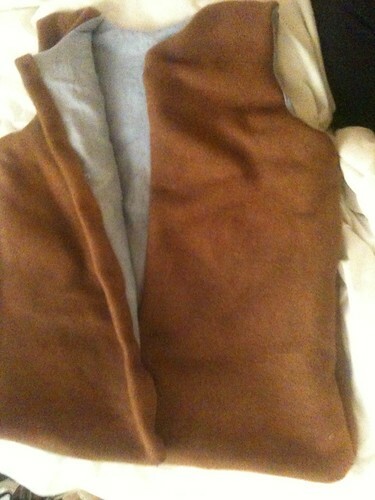 These were made exactly the same as the jerkin sleeves, except that I DID NOT SEW UP THE TOP! I was very happy with the result of both sleeves this way. I might try the design again. 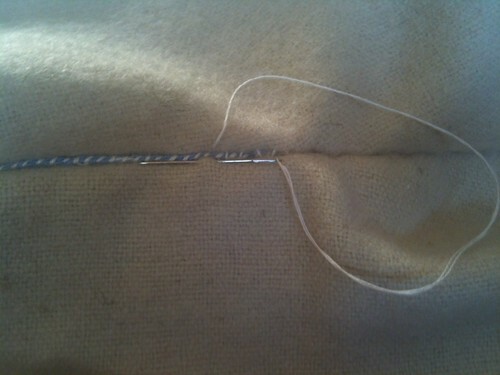 Either in a lightwweight wool, or in linen. there are fabulous examples of this made up in heavily embroidered linen. 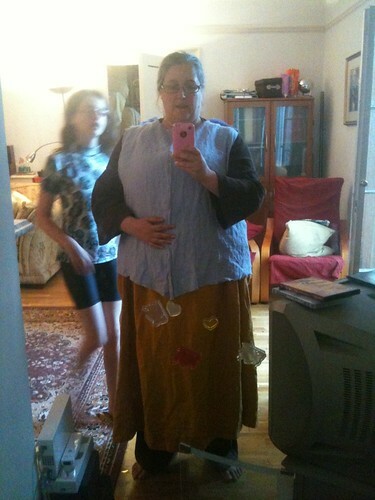 This entry was posted in clothing, Kentwell 1556 and tagged clothing, costume, kentwell, reenactment, tudor. Bookmark the permalink. I’m starting to make my costume for 2014 and am putting together a list of material I’ll need – although the jacket is last on my list of things to do! 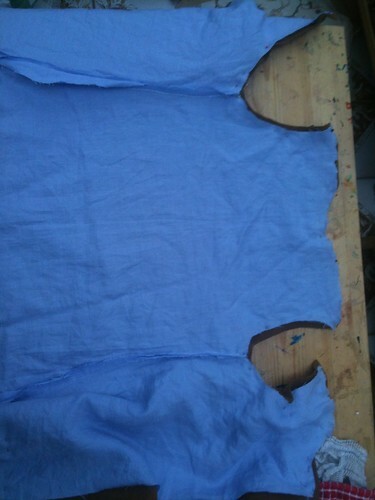 Starting with smocks, then bodied petticoat, then kirtle, and so on. Is that wise, do you think? 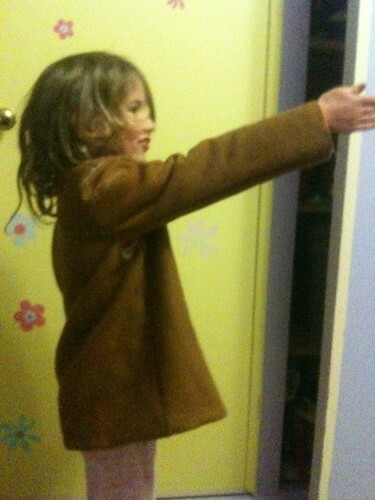 Anyway, I was wondering, just roughly, how much material you think I may need for a jacket; I’m small framed and 5’6”. Thanks! I see you are in the facebook group. Since I made my clothes in 2012,there has been quite a change in costuming. 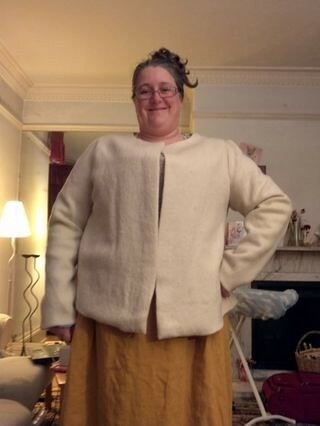 I am about to make another daughter a new style redwool petticoat bodies, but she won’t have a kirtle as well, just a waistcoat style jacket to go over the top. I am a real novice tho – as this blog says! 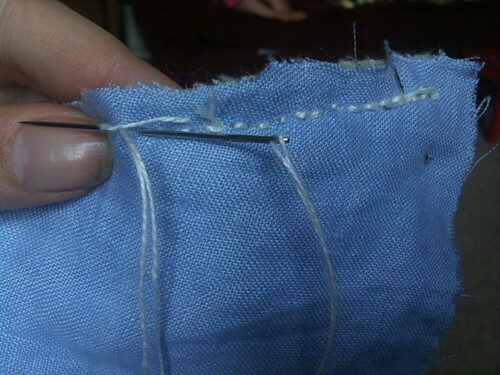 – and so for estimating how much wool you need, do you have an old sheet or some cheap material to cut a toile from, as that will help with the wool estimation. 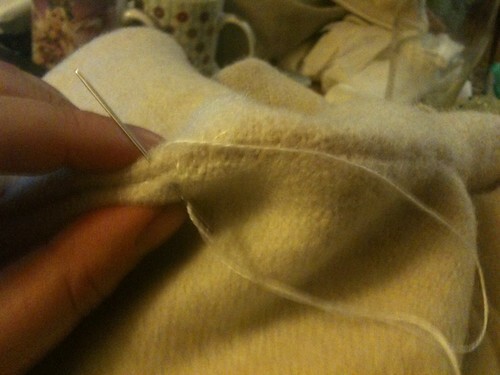 sleeves always take far more wool than you think! good luck, and look forward to seeing you in the summer of 2014.
thinking if you were clever with cutting out and made it waist length possibly 2 to 2.5 but i tend to make a toile first to see. Thanks Helen. 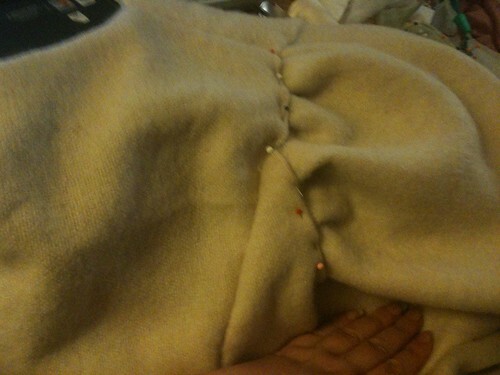 I’m going to make the jacket in that cheap orange wool I’m going to dye, so it will match my petticoat skirt. Can’t wait to wear my finished outfit! Not sure which event I will get to yet – would ideally love to do the GARecreation, but I have to tailor my flights around a friend’s wedding so I may end up doing high summer or michealmas.